Until then however I continue to sew what I have time for. 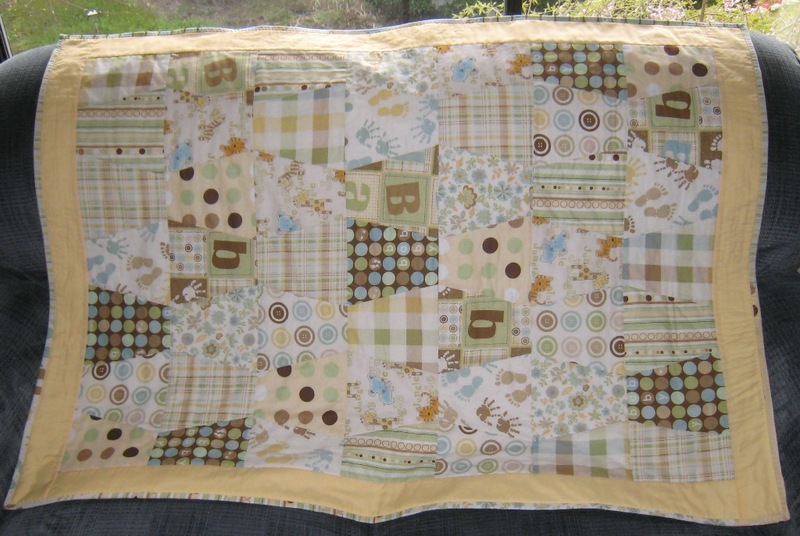 Right now I’m working on finishing one of the first quilts that I started working on in 2012. This was before life got in the way with health issues for my daughters, and my husband and my mother’s passing. Of course there is work, home and friends as well. Some days I spend more time on the computer thinking about what I want to do instead of doing the things that I should, could and must. A tale for many of us I think. 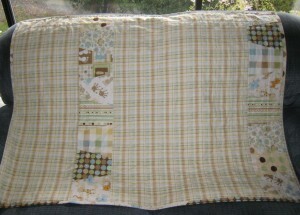 For now however, there was Christmas sewing and some baby gifts as well as a new quilt along. The one from last year will be finished soon along with the one from 2012 and I’ll continue to work on these this year. I’m trying some new and different baby gits. I’ve made baby hats, teething toys and bibs. 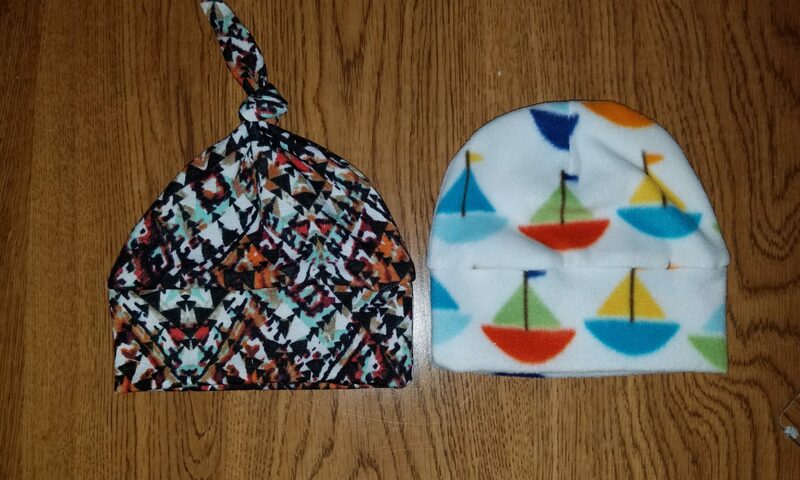 I love the baby gifts because they’re fast, colorful and usually appreciated. 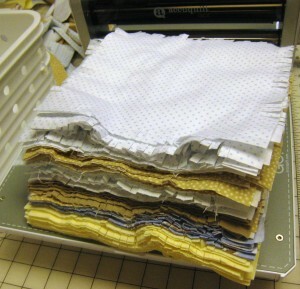 I can also try out new things, gift them and use some of my fabric stash as well. All good things in my book. 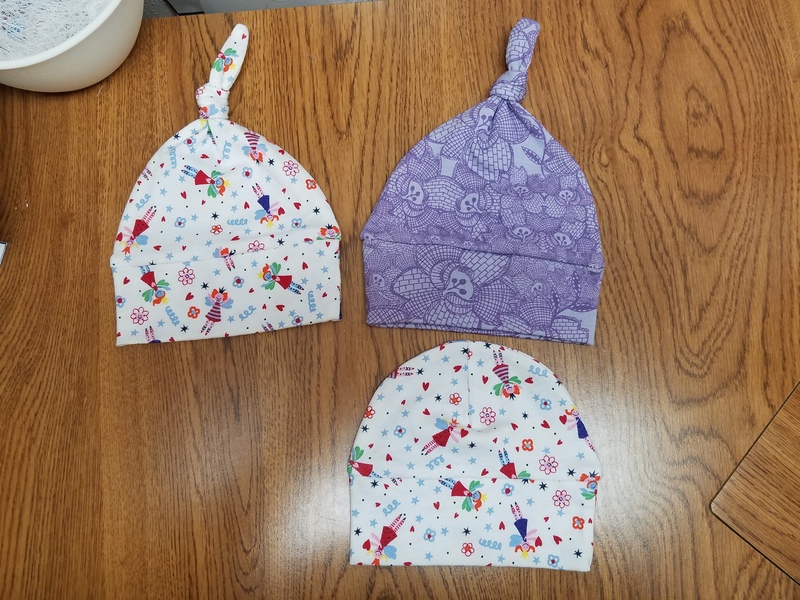 Here are some of the hats. 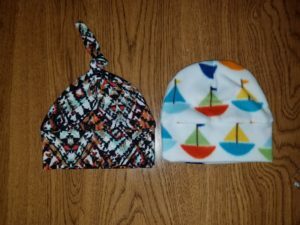 Well the last post I did about babies and the latest baby gift was hacked. Apparently I didn’t get the update applied in time and the post was deleted except for one picture. I do want a record of the things I’ve made on this blog so I can have a reference so I’m going to repost some of the pictures and text. 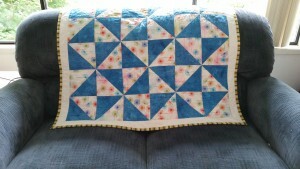 This is the quilt I’ve made for this new little boy. He’s arrived last week and his name is Parker. Such a sweet looking little boy and I’m looking forward to holding him and smell that sweet little baby smell. 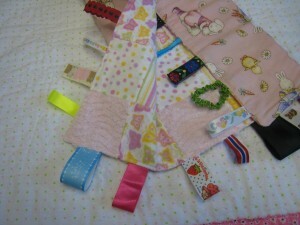 I also made some drool bibs and a tag blanket as well as some pacifier clips. I didn’t want to forget little sister. I suspect this might be a challenge for her. She is only 20 months and her place in the family is going to feel threatened. She’s now the middle child. So here is a baby doll and a blanket just for her. Fun times for all. Big sister got a book. I don’t want to forget anyone. 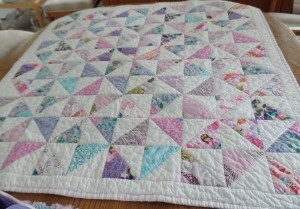 Babies seem to be the theme here and this was a quilt for my niece. She had the first little boy in my brother’s family. Exciting times for sure!. The daddy is involved in crew and repairing boats etc. 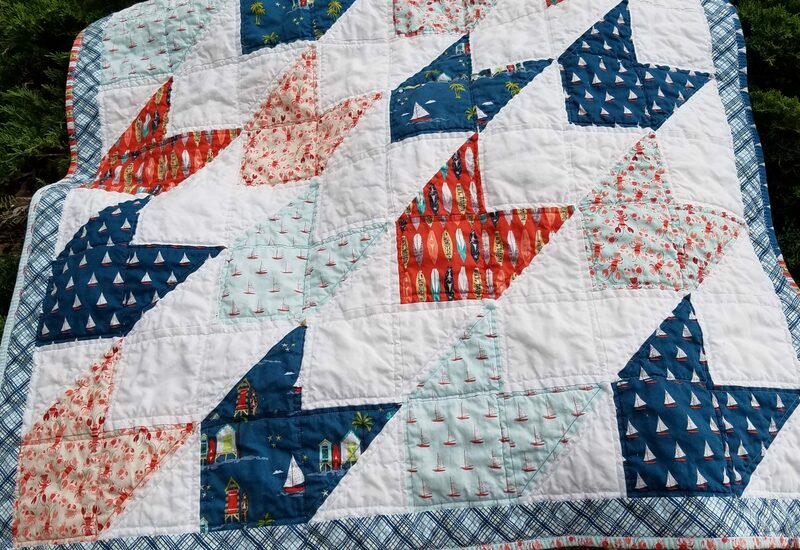 so I really wanted to use some water themed fabric and I loved this Offshore line of fabric by Deena Rutter for Riley Blake The colors and the variety of prints really appealed. Of course there were a few other things I included for the new baby. 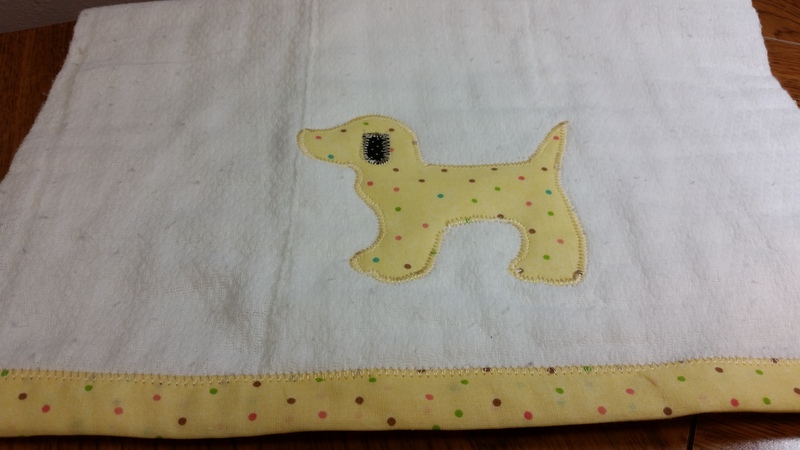 I made some burp rags with appliques and also a tag blanket. More babies are coming. I’ve made a number of baby quilts and things in 2016 and already working on the first ones for 2017. 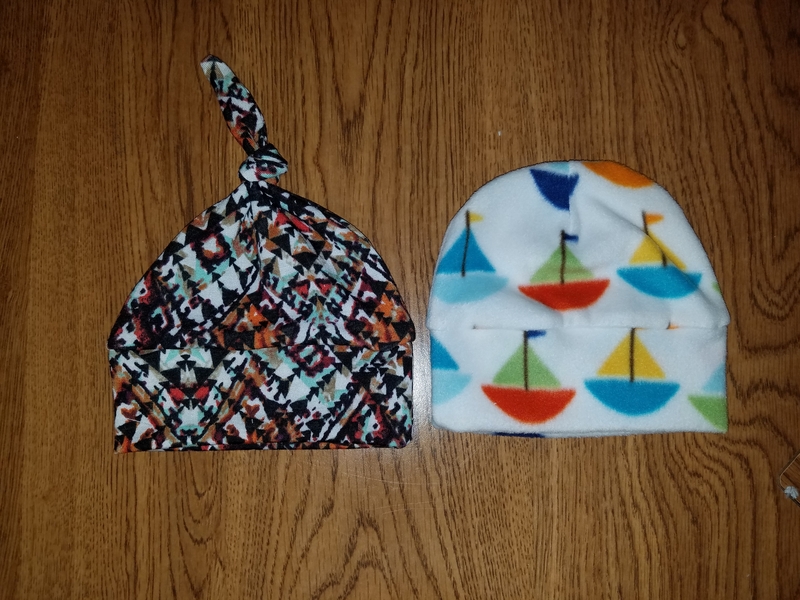 I do like making baby things because they are fast and I can try different patterns and colors. I can then pass it on but I never really know if they will be used and most often I don’t hear anything or see them being used. Occasionally, I do hear that a quilt I’ve made is an important part of the bedtime routine. Once it’s out of my hands whatever will be will be but it’s nice to know it’s appreciated. 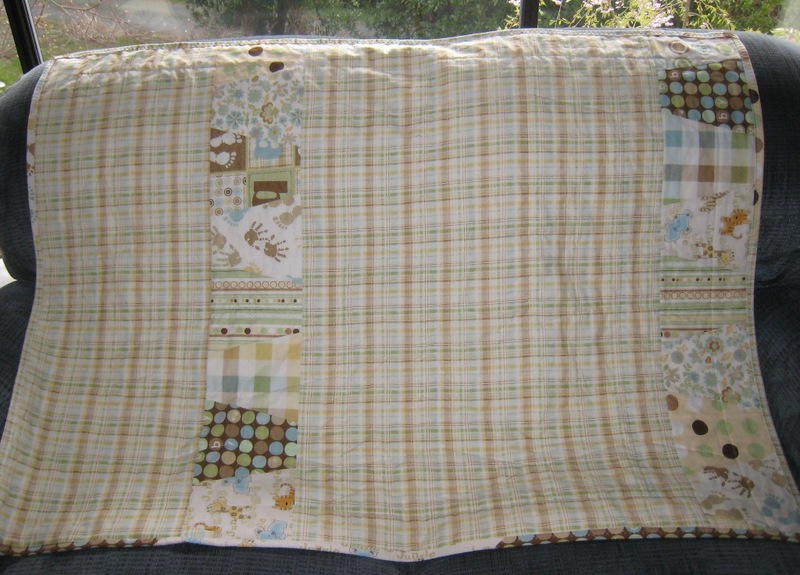 This quilt and the tag blanket and pacifier clips were for a surprise baby. The baby is anxiously being waited for by the family. Fall is in the air here in Edmonds. After an unusually warm summer it’s time to get into the fall routines. I’m working on that for sure. I have done lots of odds and ends of sewing here but really haven’t had the inclination to post much. I’m looking forward however to some updates here and continue to make a record of my finishes. I’ve got lots of plans for the fall so we’ll see how I do. 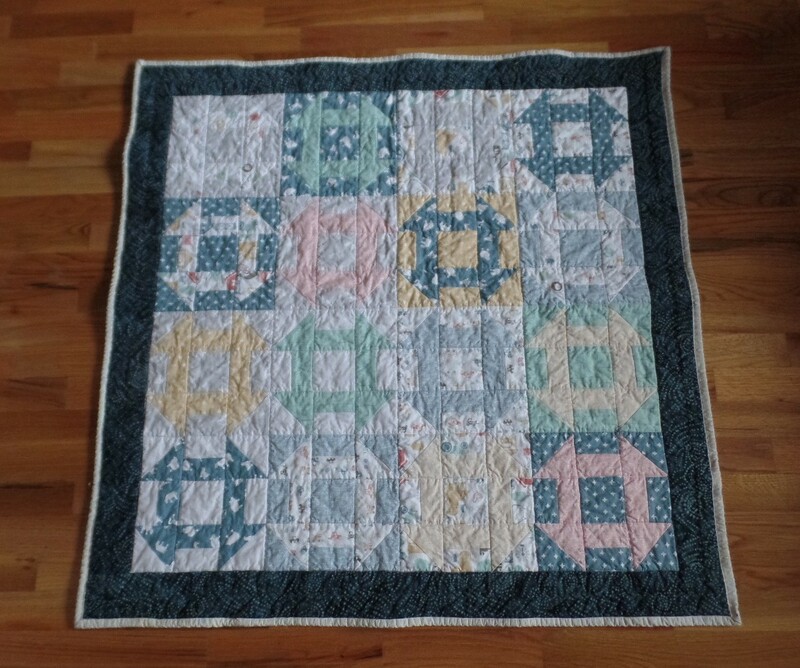 One of my finishes this summer has been a second baby quilt. This is for the friend of daughter #2 who is expecting her daughter #2. When I started this I really only expected to test the block idea and size but after I had finished several of the blocks I decided that I really like it and it would be perfect for this new baby. I did struggle with the binding for a bit but finally settled on this green stripe. 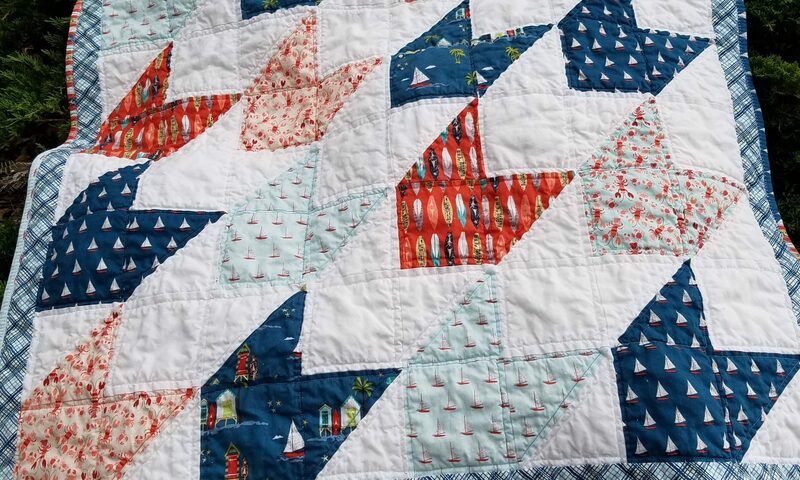 At first after it was done I thought I had made a mistake because it’s so much bolder than I had anticipated but I do think I like it and it does go with the fabrics. As I was searching for this picture I also found many others. 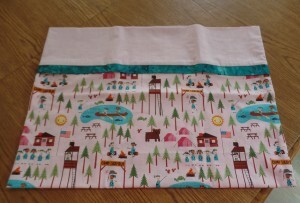 Another project from earlier in the summer was another pillowcase. This was also for a Girl Scout friend. Baby baby, can’t you hear my heart beat… well not mine I guess but I’ve had lots of fun in the last couple of weeks sewing for my niece’s new baby girl. She actually will arrive in this world June 4th but I really didn’t want to wait. There are still more babies on the horizon. Not my own grandchildren yet, although maybe someday, but children of folks that I do know. I made this new little girl a lovely “girlie” quilt. 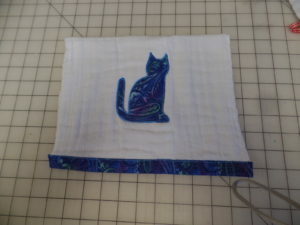 When I first started I knew the colors I wanted to use but when I cut the first pieces out it seemed too intense so I ended up cutting the strips of fabric and resewing and cutting again. I’m quite pleased with the result. 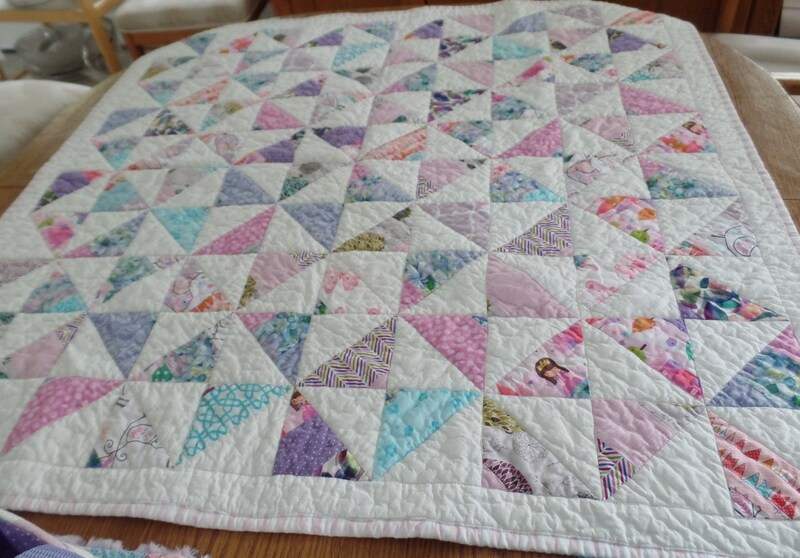 It has produced a lovely quilt that is not too jarring but very sweet. 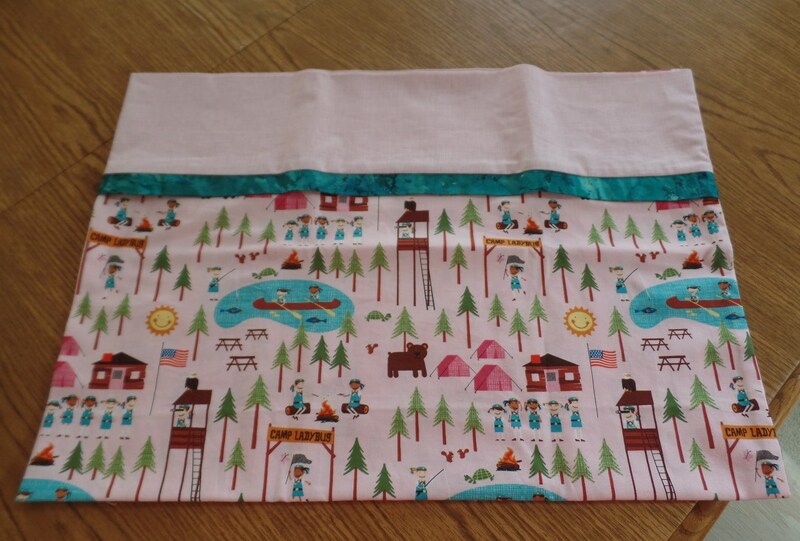 It has this cute pink dancing bunny flannel on the back. For the new baby there is also a tag blanket, a new burp rag and a darling sweater that my friend made for me to give her. I had some leftover blocks and decided that I needed to make some fun gifts for the big sister too. Now the big sister is two and a half and loves to help her mommy. She is also a great imitator and has a wonderful imagination. I just knew the big sister needed to have a new baby doll of her own. 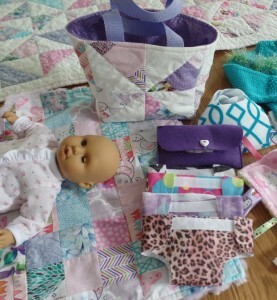 With that baby doll, she needed a few necessities to take good care of the baby so I also made her a doll blanket for that precious baby, as well as a few diapers with velcro, some diaper wipes, and a diaper bag. 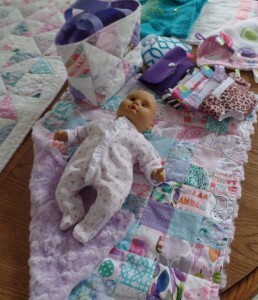 She also has a soft colorful blanket to cover that baby doll so she won’t get cold. A rag blanket finish happened this week. It actually was fun to do and I’m pleased with the finished product. 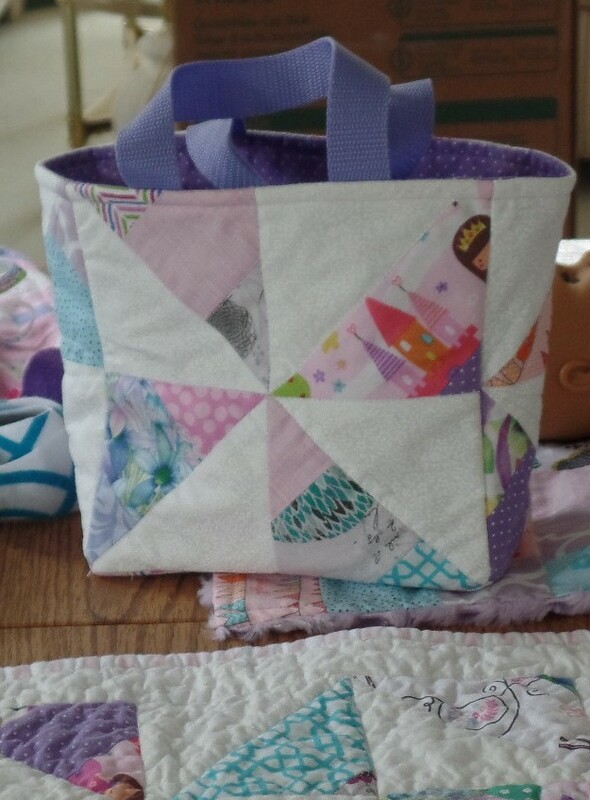 When I first bought this die I thought this would be a great way to use the flannel remnants. As it turns out, because you use two pieces of fabric in each block the remnants don’t go very far. 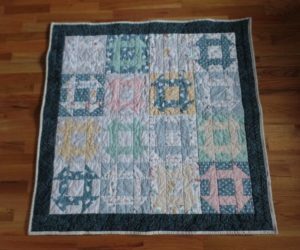 I knew that I was making this blanket for a little boy and have since learned that the mom is already in the hospital waiting for this little one to appear. It’s a bit early for his arrival however so they hope he will take his time! 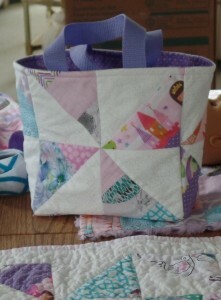 In the end, I was able to mostly use fabrics from my stash. I did end up buying a small piece of yellow. 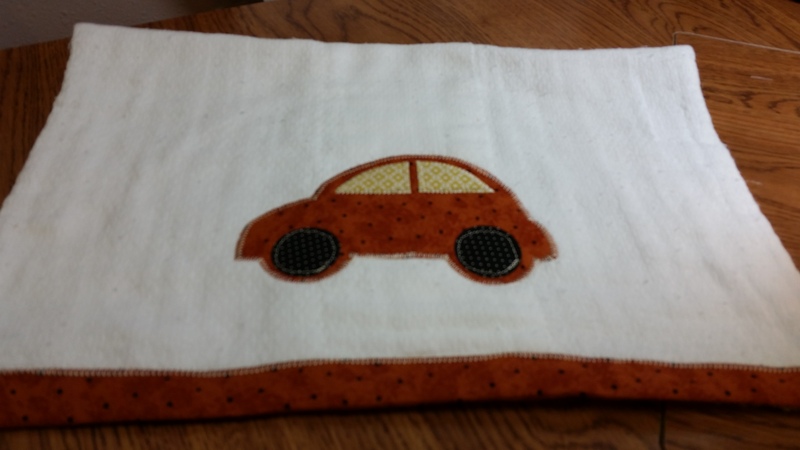 Hubby was a bit reserved about the project but was also impressed after it had been washed and dried. Like he said, it almost makes a chenille type fabric after it’s been in the wash and I’m sure it will get softer with each wash. I think I’m off to make another. A tag blanket for baby is a popular gift. When I first saw them I thought it was kind of silly but as I thought about it I realized it was actually a smart gift and something a baby would enjoy. 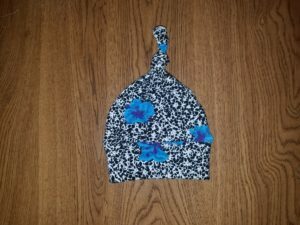 It’s small enough to put in a diaper bag or use in a car seat or stroller and might even be good in a crib at nap time. I know that when my kids were babies they liked to rub things between their fingers and it helped to sooth them. This blanket has something for every mood. It has lots of color and many textures. 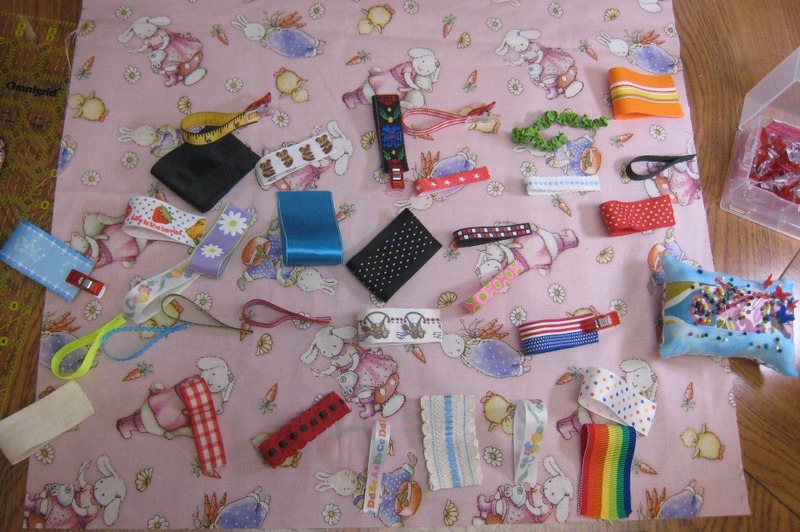 When I was making it I did wonder if there were too many tags or too many colors. I opted for many textures and many colors. I think this will make the blanket useful for a longer period and should appeal to every childs fascination with color and texture. 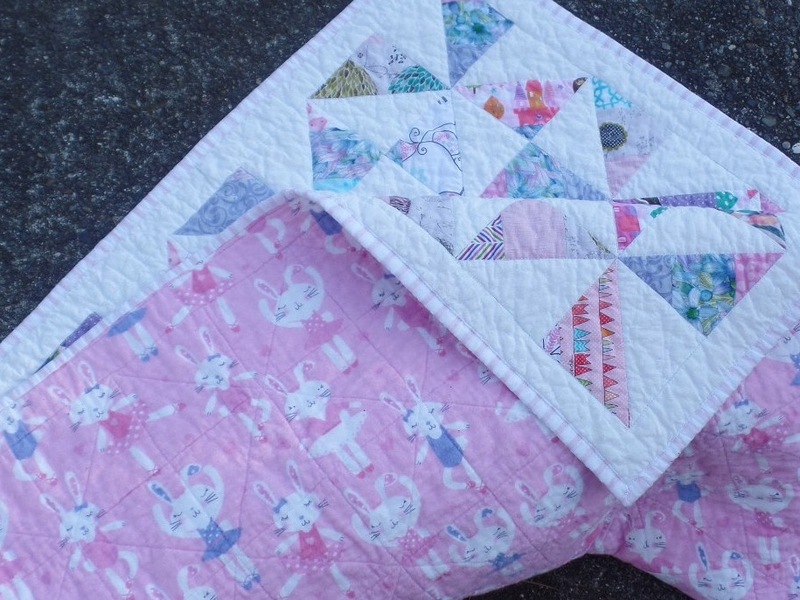 The front of the tag blanket is a piece of fabric that has cute little bunnies. 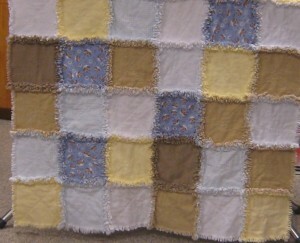 The back of the blanket is a piece of fabric I purchased that has alternating squares of flannel and chenille. 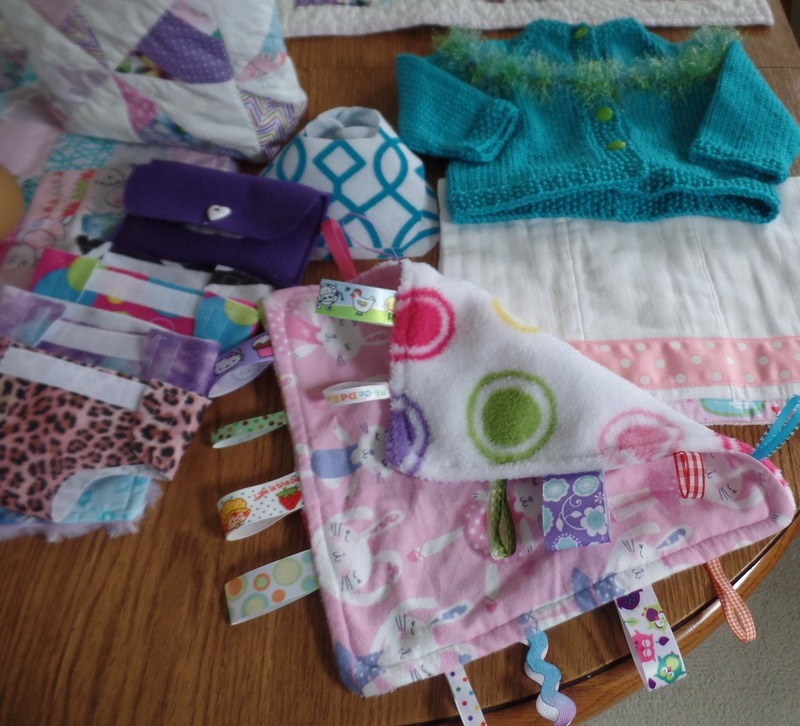 Lots of interesting things for baby to look at. I’m also going to enclose a couple of link toys so mama can attach toys to the ribbon tags or even attach it to the side of a stroller or car seat. When baby gets tired of it and throws it, this tag blanket for baby will not go very far! 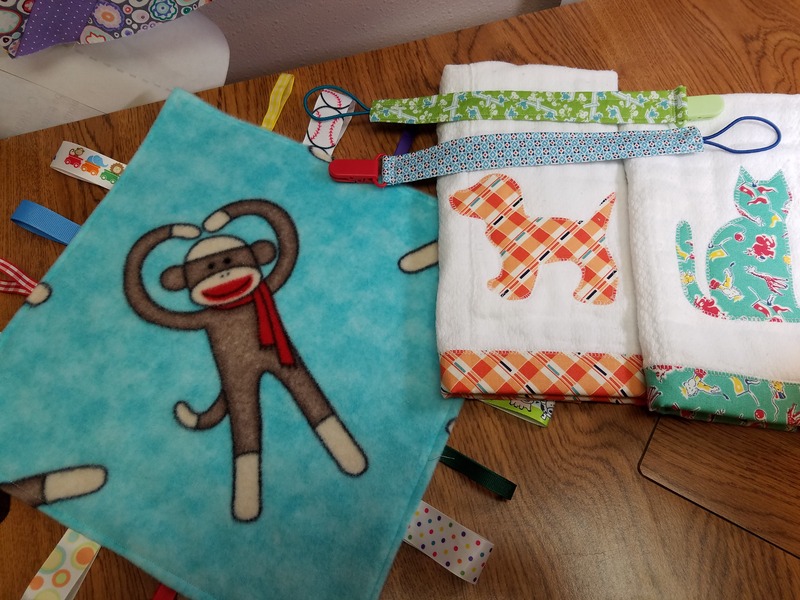 Oh baby baby gift… I love to make baby gifts but it’s so hard to make a decision. There are so many useful little things for babies like blankets, hooded towels, clothes, booties, bags, spit rags and more. I had to narrow my list this time because there wasn’t too much time. Just a few days in fact. 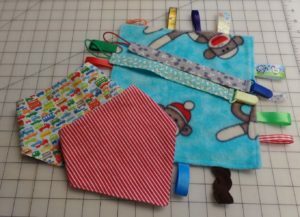 This time I decided to make some bibs and a tag blanket. Of course this certainly involves come choices as well. 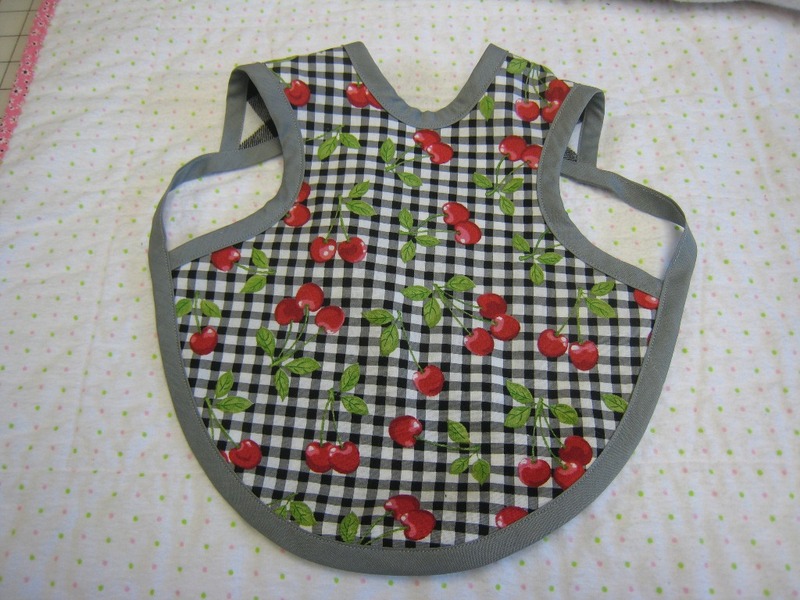 What size bibs, what kind of fabric, what type of bib and what should I put on the back. These were all for a little girl with a modern mama. 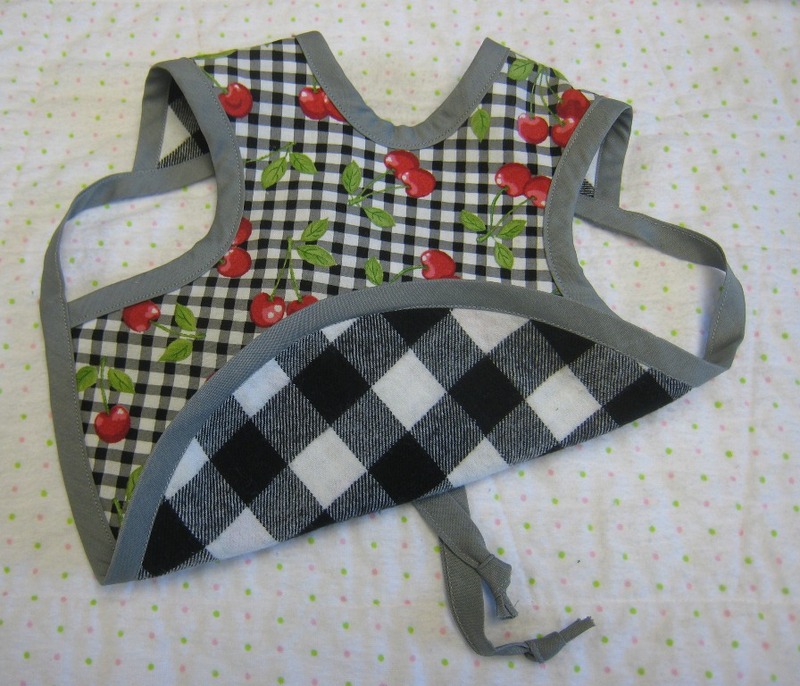 I decided that really, these bibs would get spilled on and slobbered on and were really for protecting the clothes so although I wanted them to look cute function was the primary purpose and even a modern mama would know that. This allowed me to do some experimenting. 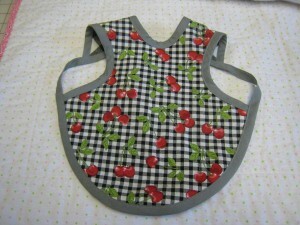 This is the first bib. 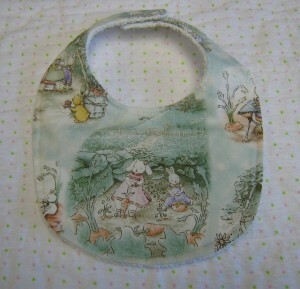 A small bib for a little girl with a bunny on the front. The small size could be used for a small child and would be cute and functional. 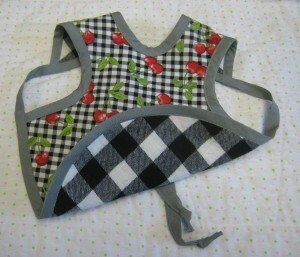 The next bib is a larger bib with a wider front. 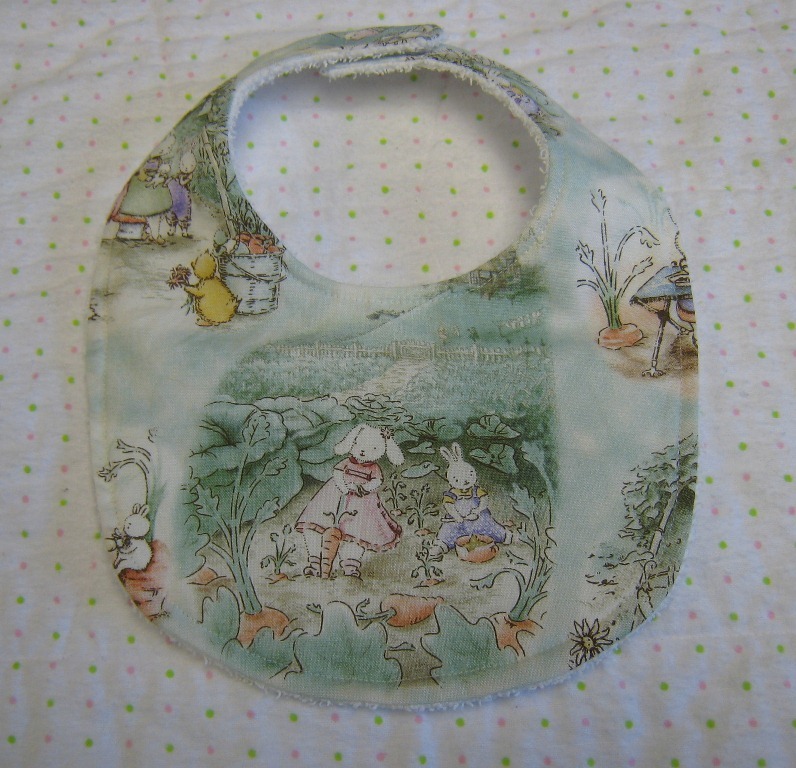 This bib I backed with minky which is a polyester fabric and should allow some moisture protection for the clothing underneath. 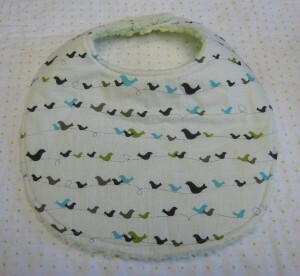 I’ve never thought of using minky for the back of a bib. It actually worked better than I expected and is quite soft. I wonder how mama will like this one? This last bib is cute in an entirely different sort of way. It’s more like a baby apron. 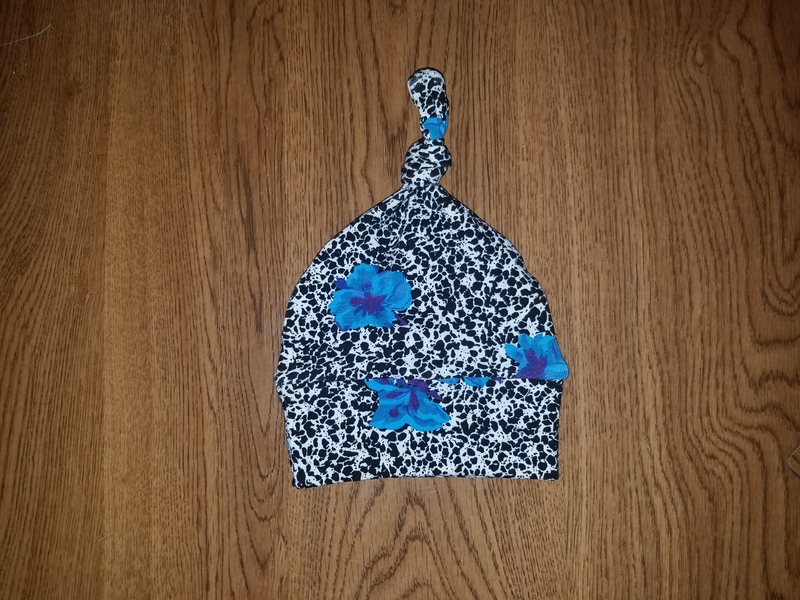 I know that mama likes gray and it also lets me use a bit of color so this one too is cute and should be quite functional because it covers the baby lower front and lap. I lined this one with flannel so it is soft and shapes easily to the baby shape. Oh this was a fun baby baby gift! 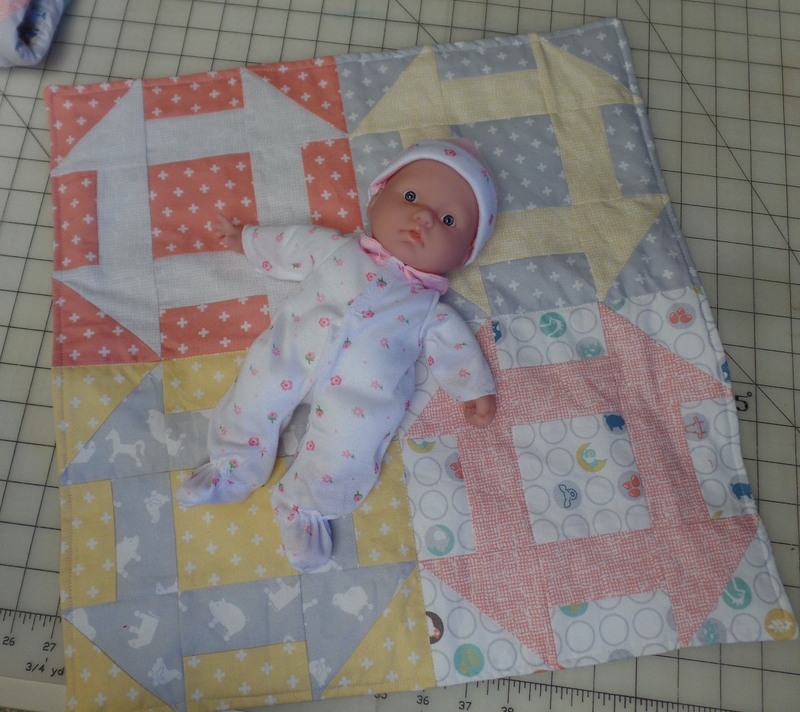 Another baby quilt is finished. I’ve used tumbler blocks again I’m pleased with this one. The colors are not in my normal range of color choice but I do like the way it turned out. I don’t know if the baby will be a boy or a girl. I used ten different fabrics in this quilt and it made a better mix than the previous two. The pink one had seven fabrics and the red and blue one had five fabrics. 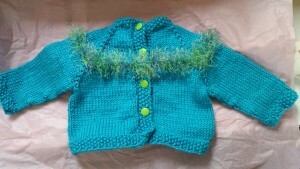 I like both of the others but this one has a better balance and will be soothing for a baby. The back was an interesting dilemma as well. I had a remnant of one of the front fabrics but I knew it was short. I ended up adding two rows of blocks from the front. They fit in well. 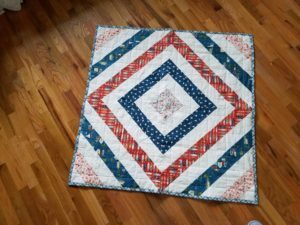 One thing that I had not thought about when I made the choice for the back was what the plaid would look like and if I could get it on straight. 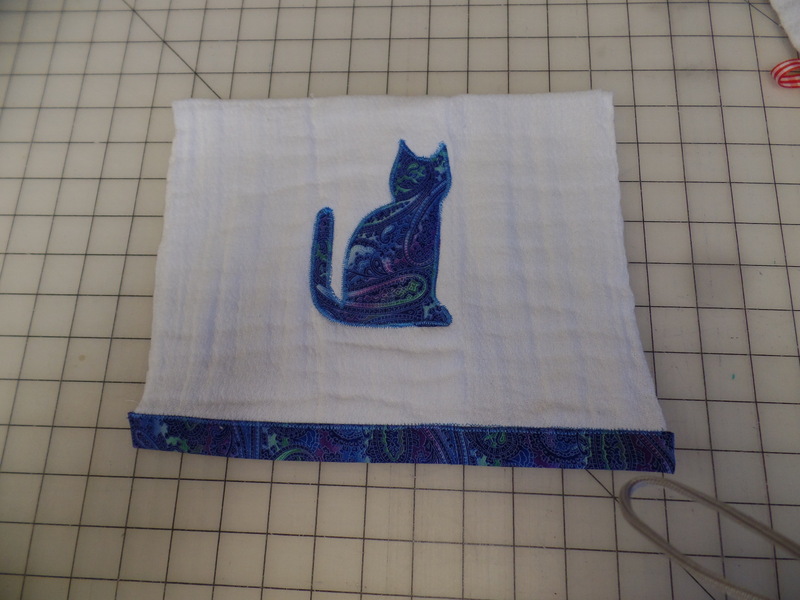 I ended up washing the fabric before I started because the fabric was stretched. It did straighten out well and I was able to get it straight enough that it looks good. 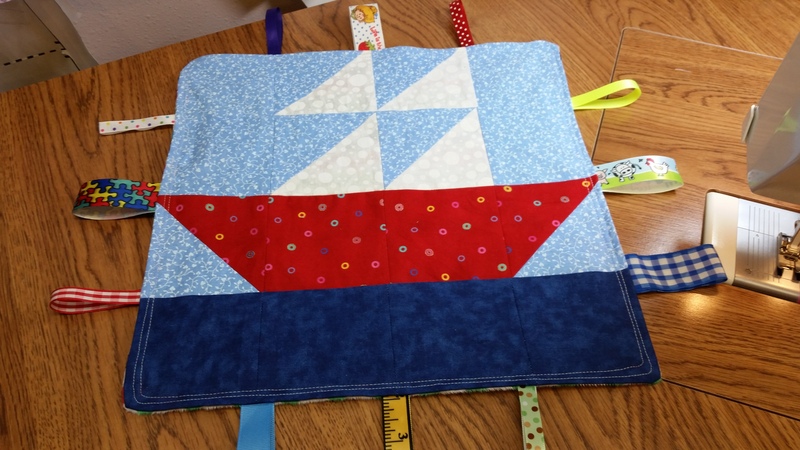 The binding is pieced some of the quilt fabrics and was another good choice. Hope the mom likes it. In any case, it will be a good floor quilt and wash and wear well.